Surf Pendleton – Win a Custom Board by Blackfern! 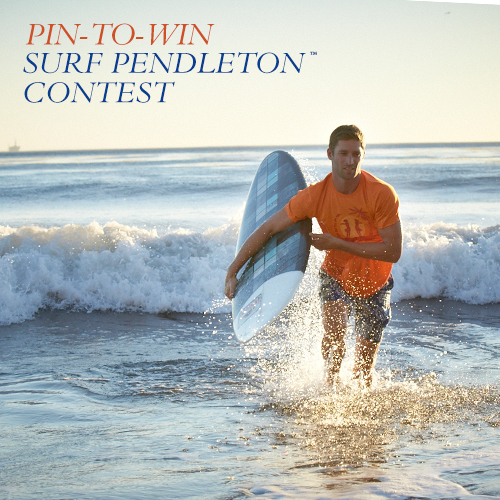 To celebrate its surfing roots and the new collection, Pendleton is hosting the Pin-to-Win Surf Pendleton Contest March 17 – April 28, 2014. Grand Prize is a custom Pendleton Surfboard in the original surf plaid worth $1200; Second Prize is a $400 Pendleton gift card; and Third Prize is a $200 gift card. Contestants enter online using their Pinterest account information. Blackfern Surfboards is a backyard board company based in Portland, Oregon. Started in 2008, it possesses a distinctly Oregon ocean-meets-the-forest aesthetic. The company creates one-of-a-kind custom surfboards designed in collaboration with each customer. Each board is handmade in Portland by local wave-obsessed surfers. Waves off the rugged Oregon coast are like no others on earth. After much frustration with boards that were not suited to Oregon’s choppy waves, veteran surfer Mike Hall decided to shape his own board – and the rest, as they say, is history. With much trial and error, he found a set of design characteristics that perform well in Oregon’s unique waters. After designing boards for a few friends, Mike devised the Blackfern concept – a grassroots effort to put locally made custom boards into the hands of those who venture into the Pacific Northwest surf. In tribute to a time when Pendleton was a vibrant force in the California surf culture, a 1960s-era single-fin model was chosen. This timeless retro board embodies the lifestyle of the era – clean, simple and stylish. From start to finish, each is a handmade work of art – shaped, painted, glassed, sanded and glossed by hand in Blackfern’s fabrication studio in Portland. The first step is to trace the outline of the board onto a blank, which is a rough-cut piece of foam. Next the bottom is crafted, then the top is shaped and foiled. Then the rails are formed and the final shape begins to emerge. The final steps of the shaping process are the installation of the slider single-fin box and a sanding to a buttery smooth finish. At this point, Mike writes the customer’s name, board dimensions, and “Pendleton Surf Limited Edition” on the board. Next the Pendleton plaid or stripe pattern is applied. Then comes glassing – a four-step process that consists of two laminations and two hotcoats. Finally, a gloss coat is applied and buffed to a candy-like luster. Tools and hands have passed over every square inch of the board dozens of times.